Knowing how to edit in Garageband effectively is certainly the key that opens up almost unlimited creative possibilities and shows the surprising power of this seemingly simple recording software. In fact, once we learn the basic technique for making simple edits in Garageband we are only limited by our own imaginations. 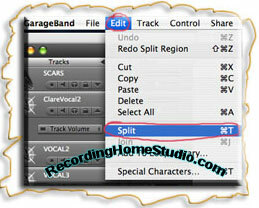 For this article we’ll have a look at the basic process of how to edit in Garageband. NOTE: Remember, the following techniques are similar in all recording software and for you PC users, there is a program called Mixcraft 5 that is very similar to Garageband. You can download and try Mixcraft 5 free here. However, for truly stunning editing effects and step by step recording tips and tricks, you will be interested in my book, “Easy Home Recording Blueprint.” Contact me at the link at the bottom of this page so I can include you in the advance copy list. Under the Control menu at the top of the window, turn off the “Snap to Grid” option. This will prevent the song position cursor from defaulting to the nearest beat or bar and will allow exact, manual positioning so you can pinpoint your edits and cuts. Each track’s waveform is known as a “region” and therefore, each time you split a region you give birth to another region. These regions can be moved around and copied and pasted elsewhere on the track or to entirely new tracks. 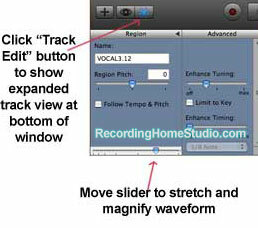 Just being aware of this, is like a road map for creating pro sounding effects and sound layering tricks. In my free email newsletter and in even greater detail in my book, I illustrate exactly how to edit Garageband (of course, my step by step editing tips also work for any recording software) to create monstrous guitar sounds, how to record good vocal tracks that are a mile wide, huge drum and synth sounds and thunderous and clear bass. Sign up now on the right side of this page or click the “Contact Us” link at the bottom to be notified when your advance copy of my eBook is available.